The Ortigas Art Festival is open to all and encourages appreciation and collaboration through exhibits and workshops. MANILA, Philippines — For many people, engaging with art can be an isolating experience. This is true for both the artist and their would-be viewers. While the artist struggles to bring forth something of their own creation, from their very own hands, the audience grapples with trying to understand what it means, questioning its significance — if the piece ever finds itself in front of them at all. This is often the case, and is what, according to social realist painter Renato Habulan, necessitated the Ortigas Art Festival at Estancia Mall. Now on its sophomore year, the Ortigas Art Festival has grown significantly from a little over 60 artists to 130 for this outing. Ortigas Art Festival’s curator, Helen Mirasol, said in her opening remarks during the festival launch that, “The concept is simple: to present art to the public in the most open and accessible way.” The no-admission-fee festival continues to host not only an art exhibit, but workshops for the public to participate in as well. Feb. 23 saw a print-making workshop by Benjamin Cabrebra; on Feb. 24 and March 2 there was a watercolor tutorial headed by Peter Sutcliffe; and on March 3, Renato Habulan introduced Print Alla Prima to interested mall-goers. The art festival and the workshops are meant to foster not just collaboration between artists, but with their audiences as well. Habulan says that “artists have that responsibility” — to create connections with their respective communities, to uplift other artists, and to find value through their own work. 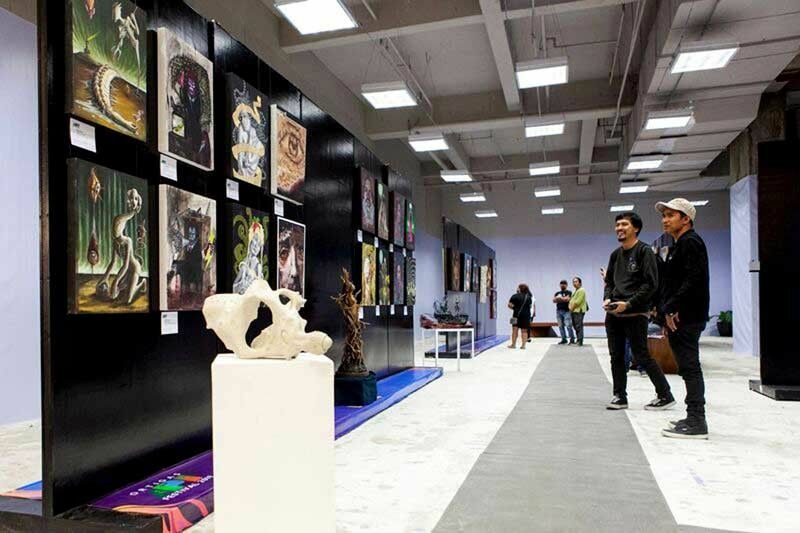 One of the basic tenets of the Ortigas Art Festival, according to participating artists, sculptor and architect Richard Buxani and self-taught artist Darwin “Japat” Guevarra, is that new artists and mid-career artists receive equal footing, and are able to exhibit without worrying about the costs. Ideally, it will benefit younger up-and-coming artists, making headway for them to break into the Filipino art scene; for mid-career artists, it may help them to reacquaint their work with the now, and engage with more people, hopefully giving them renewed significance, and a firmer foothold in Philippine art history. There are a lot of ways to probe such a concept: we could question how an art festival held at a mall could be “breaking new ground” (because patrons of Estancia are, arguably, not of the majority), and we could say that this is not quite yet the masses they may be hoping to reach. The event will likely grow in the years to come, and hopefully, it provide answers to these questions. The launch event for Ortigas Art Festival 2019 was succinct in its message. The ultimate goal, in this case, is for Filipino art, of all types and as many mediums as possible, to reach a wider audience — not in the format of a typical exhibit, without the barriers of payment; it is for artists to reach out and for audiences to immerse in its process without being asked to do so, to make the first move toward that; it is for art to be seen and for artists, new and old likewise, to be heard.